When internationally acclaimed aluminium diecaster CastAlum wanted the parts they supplied to meet the highest possible cleanliness standards they came to MecWash for the perfect washing solution. Mid Wales based CastAlum supplies parts to the UK, Germany, Poland, Canada, Mexico and the Far-East, for the automotive industry for use in vehicles manufactured by VW group, Aston Martin, BMW, Ford, General Motors, Fiat, Renault, Porsche and Mercedes. What CastAlum needed was a machine able to clean a variety of parts, mostly clutch housings, but also to have flexibility so that any combination of different sized parts could be washed. Richard Blythe, Project Manager for CastAlum, said: “We were installing a new production system and the MecWash Duo 600 was perfect for what we needed because it is a highly versatile aqueous cleaning system. “Based on the well-established MecWash design of a rotating drum, within which components are held in tailored fixtures, the Duo 600 is able to clean both our large and smaller sized gearbox components in any combination of stacked fixtures. This particular model also has a 600x600 opening at the front to enable our larger clutch housings to be put in, again ideal for our needs. “We have now installed the Duo 600 and are already benefiting from the higher cleanliness levels achieved, which is something our customers demand, as well as the flexibility of the machine which can be used for washing all of our components, whatever their size, without the additional cost of installing another machine. The fixture loading system features a convenient quick release system which allows parts to be taken directly from the CNC machine to the Duo 600 with minimum fuss. I would definitely recommend installing a MecWash system,” he added. The Duo 600 parts cleaning system is a natural progression of the established Solo system. It has the added benefits of flood / immersion washing, which provides higher standards of cleaning by full solution contact with all component surfaces, and a re-circulating heated spray rinse, which provides higher standards of surface finish by removing detergent residues left by the wash solution. The rinse stage can also be used to apply a longer term corrosion inhibitor for ferrous components, all finished off with a hot air dry. 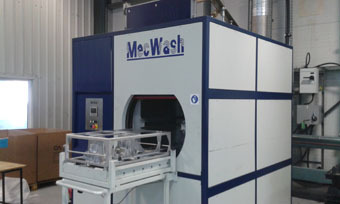 For more case studies from MecWash please visit the dedicated case studies page.